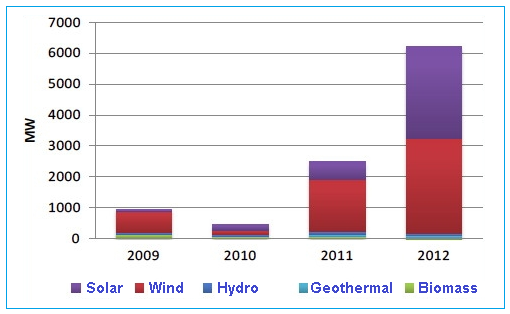 In the last 2 years Renewable energy in Chile has been on the uptrend. This is good considering Chile, and in particular Atacama dessert in the northern region, is one of the the most irradiated places in the world. This makes it a suitable place to build solar farm. Chile is surely one of the leaders in the emerging Latin American/Caribbean market for renewable energy. REW reported that Renewable Energy Center in Chile (CER) quoted over 3.1GW of solar energy projects being approved in 2012 through November, and another 908MW awaiting approval. 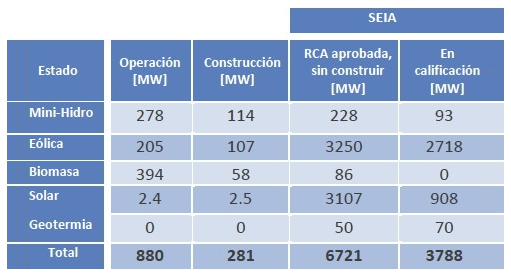 As for overall renewable energy projects (hydro, wind, biomass, solar, and geothermal), the CER counts 6.7GW of renewable energy projects approved in Chile, and another 3.8GW in the wings. "Chile faces a growing energy demand from its sustained economic growth. Solar energy in particular has tremendous potential to change the demography and the economy of northern Chile, opening it up to new opportunities beyond mining and fishing, into water desalinization, hydrogen production or large green data centers." Full article and more data at RenewableEnergyWorld. Figures and graphs sourced from the site. Putting things into perspective, Malaysia's maximum demand (West Malaysia) is 14.9GW (2010) and in Sabah it's about 830MW in 2011. It seem that Chile's current RE generation is able to power up Sabah without having to go to fossil fuel. That would be cool! Chile's population is 17.3 million with GDP of USD248.5 billion (2011). Malaysia's population is 28.8 million and GDP of USD278.6 billion (2011). Malaysia and Chile are relatively 'young' in their green policy, both having started more aggressively only about two years ago. Sure, we have more mouths to feed with just slightly better GDP, but we have done nothing (or to be fair, so much less) compared to Chile when it comes to implementing RE initiatives. It is time to get on par with others, don't you think? I think solar is a very good option for Sabah as gas is not yet available in the east coast and it will be a real costly to run 64mw on distillate for Kubota PS,i was wondering what happened to the Tawau Geothermal PS? In a press statement last month, Datuk Peter Chin said the plant would start producing electricity in Jan 7, 2013. As it is now, we are still waiting for that to happen. Hope they don't go beyond Chinese New Year. Tawau 30MW geothermal power plant is expected to be operational in 2014. Hey, may I request you to blog about Nicola Tesla's work? Thanks in advance, de engineur. I mean, his theory about generating electric power without the use of any substances like coal and so on. I read somewhere that he invented a light bulb that never stopped working and a car that didn't use petrol. I don't know if that is true, maybe you could share your knowledge about Tesla's many amazing discoveries? @Gunaqz - thanks for stopping by. Tesla is no doubt one of the well known engineers/scientists during his time. He researched, imagined, and invented things well ahead of time and his works are well documented. One wud be better of reading the many existing articles than a short blog I could offer. That name reminds me of the SI unit still used till today - Tesla - to measure magnetic flux density. Of course some of Nikola Tesla's works were credited to others. But that happens all the time.